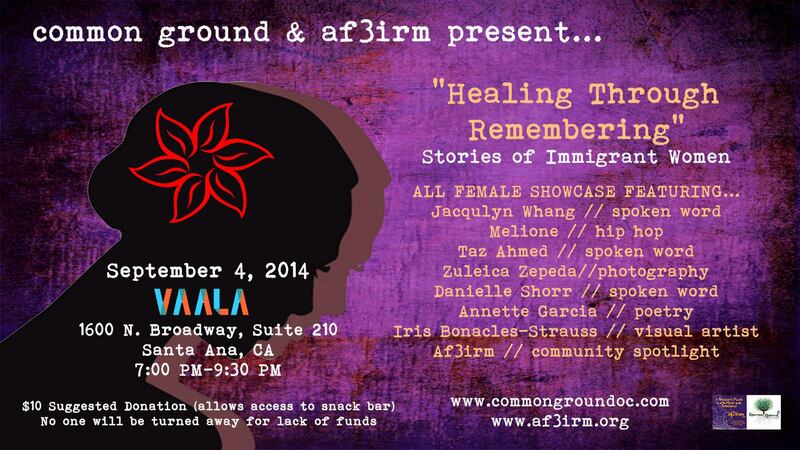 AF3IRM Orange County to host Open Mic with Common Ground at VAALA Cultural Center in Santa Ana! We are AF3IRM. We are the daughters and granddaughters of immigrant, transnational women. We want to share their incredible stories of strength and survival as they crossed borders, both physically and emotionally. We aim to highlight how the women in our lives were affected and how they, in turn, have affected us. Our roots fill us with nostalgia – a longing for a homeland, a home in which some of us have never been to. What does ‘home’ mean to our mothers and what does ‘home’ mean to us? Not only should we share stories about our roots but we need to make the connections to our own lives so that we can understand the issues we face, as women, in our world today. As transnational women, we carry with us the trials and tribulations that our foremothers have faced. We must learn from them so that we can create a strong sense of home where we choose to lay down our roots. We want this night to be expressive, intimate, and interactive and to use this space to share the memories of the struggles and triumphs of immigrant women. If we do not feel connected, sometimes uncomfortable, with these stories, then we cannot cope with our identities and our feelings. This night is to remember and reflect upon the stories of our immigrant mothers but it is also to raise awareness and to go forth into militant action with understanding, love, healing, and optimism in order to better/empower our lives.